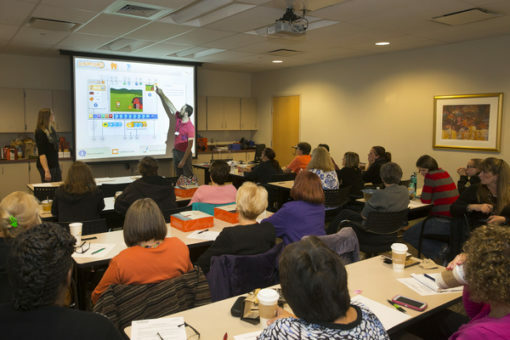 MAKESHOP » Teaching Teachers About Scratch Jr. 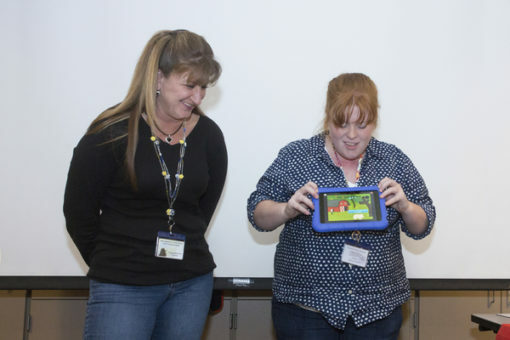 Teaching Teachers About Scratch Jr.
A couple of weeks ago I was given the chance to teach a group of Pre-K teachers about Scratch Jr. You can learn more about Scratch Jr. from a previous post by Molly here. This was one of the most fun professional developments that I ever taught. 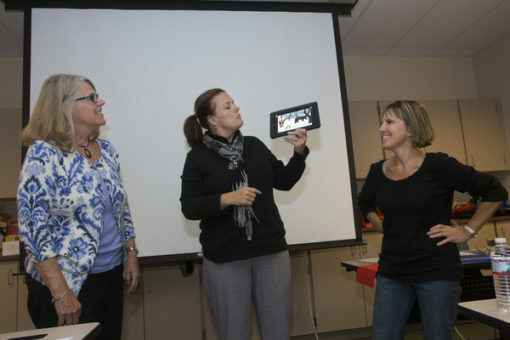 The plan was to introduce the teachers to a couple of creative programs that could be used in their classrooms. Scratch Jr. took center stage. The program is really intuitive. 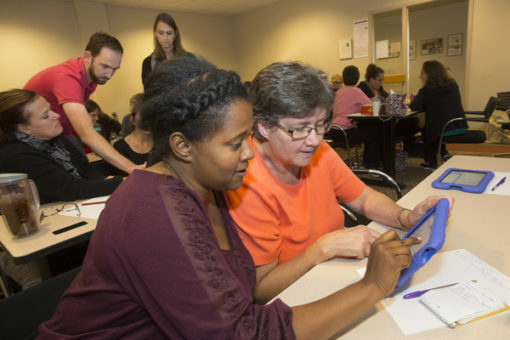 The teachers were easily able to start exploring the app all on their own after a brief introduction by Elise and I.
I always enjoy being i a room full of teachers who are having fun with something creative and open ended. You can literally hear people developing and brainstorming lessons plans as they play. And that is what is so important about these MAKESHOP professional developments. We don’t just want teachers and other educators to learn about the latest trend or a new digital program. What I really want is for the teachers to be able to communicate with each other about how these new forms of teaching and learning are going to translate into their classroom. While exploring Scratch Jr. I heard a lot of teachers coming up with ways for their students to use the app to tell stories. Other groups of teachers were using it to match visual objects with their written names. While others were simply using the program as a drawing tool. The opportunities for incorporating a program like Scratch or Scratch Jr. into a classroom are vast in number. It just takes a group of teachers to see the potential in a program like this. Like I said, this was one of the most enjoyable classes I have ever taught. Not only because of how intuitive, creative and cute Scratch Jr. is. But because of the brainstorming and engaging discussions that the teachers had while exploring and playing. Experiences like this are truly rewarding.